Pumpkin takes center stage, as does pecan typically but good old apple pie holds its own on any festive table. 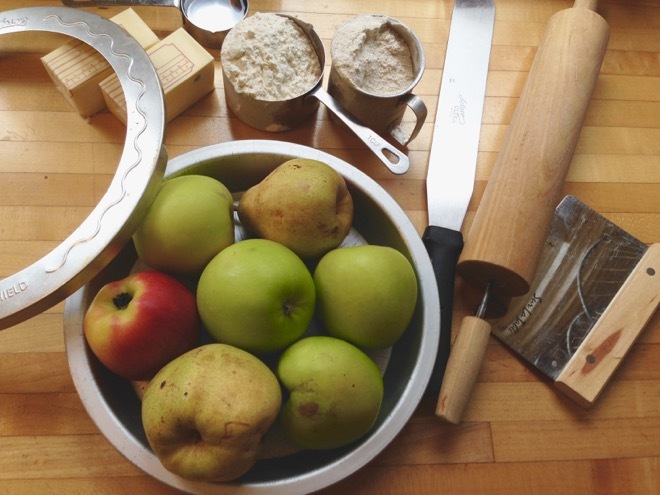 Mix and match whatever apples you might have on hand, toss in a pear or a quince, or stir in 1/2 cup of apricot jam and watch as people gasp and exclaim over how perfect and mysteriously fabulous your pie is! The cook-with-what-you-have philosophy lends itself beautifully to pie! I will be adding a good dollop of Italian prune compote to my sour cherry pie this week too. PIE CLASS? I love really good pie (crust) and am contemplating teaching a pie class in the next few weeks. Let me know if you’d be interested. Fruit pies, nuts pies/tarts, custard pies. . . all with excellent crust. It would be in Portland, OR on a weeknight evening or weekend afternoon, 2+ hours. This is a pretty classic apple pie. You don’t want to slice the apples too thinly or they’ll get mushy in the pie but too big and you’ll end up with rubbery chunks. It also depends on the kind of apple. If in doubt, slice fairly thinly. This is my all-time favorite pie dough; it’s simply butter, salt, flour and water but the technique is revolutionary. Once you do it a time or two it becomes second nature so don’t be put off by the extra step. Or use your favorite pie dough recipe. Put the apples in a large bowl. Mix the sugar, cornstarch, cinnamon and nutmeg (if using) and lemon zest and jam (if using) together in small bowl. Sprinkle it over the apples and mix well. Drizzle on lemon juice (if using). Place one disk of dough on a lightly floured surface (right on the counter is easiest unless you have a tile counter). Lightly flour each side of the disk and a rolling pin. Roll from the center out and roll the dough until you have about a 14-inch circle. You want to make sure the dough does not stick to your work surface and slide a spatula under it to loosen up if it does and sprinkle more flour on the counter. The edges of the circle may crack a part but just pinch back together and don’t worry too much about the very edge since it’s going to get crimped anyway. Roll the circle of dough up onto the rolling pin and transfer it to your pie dish, unrolling gently. Lightly press the dough into a 9-inch pie pan and make sure the dough goes all the way out to the edges or the base of the pie pan. Roll out the second disk of dough. 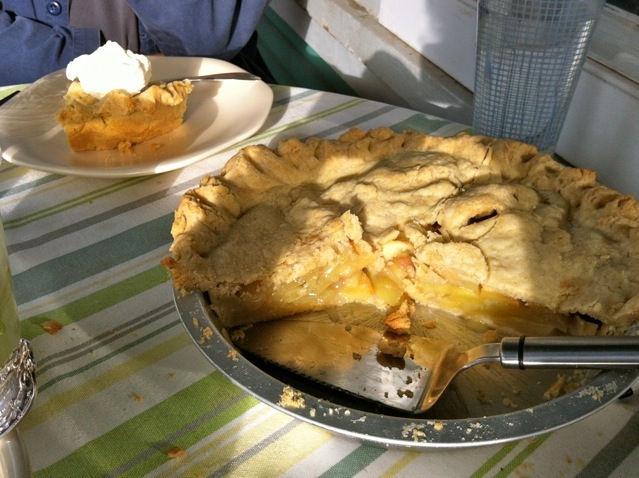 Fill the pie shell with the apple mixture. Dot filling evenly with butter. Carefully lay the top crust over the apples. Trim the overhanging dough with a sharp knife all around leaving at least a 1-inch overhang. Flour your fingers and crimp the two layers of pie dough together by pushing your right pointer finger into a “v” shape created with the thumb and pointer of your left hand, holding the edges of dough. Repeat around the whole pie, re-flouring your fingers as needed. Prick the top of the pie a few times with the tines of a fork to create holes for the steam to escape. Bake the pie at 450 degrees for 10 minutes then reduce the heat to 350 and bake another 35-45 minutes until the apples are tender and the crust is flaky and just slightly golden. Cool on a rack and serve warm or at room temperature with lightly sweetened whipped cream or vanilla ice cream. I’m definitely going to try that….and I wish I could come to a pastry making class! My 16year old is the most successful pie baker in this household. I’ll definitely share it with him!